From what I heard, it will be coming this fall. I have been a loyal Scottrade customer for nearly 10 years. During this time, I have opened trading accounts with multiple brokers, each of which has its own services and features, but Scottrade has always been my primary broker for most of the trades I have made so far. The main reason for choosing Scottrade over other brokers is that it has almost everything I want from a stock broker. 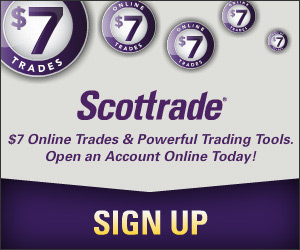 Sure, at $7.00 per trade, Scottrade isn’t the cheapest broker out there, but it has a referral program that allows existing customers to earn commission-free trades for each new customer they refer to Scottrade. That’s how I avoided trading commissions for more than three years with Scottrade. Plus, it has a few more services that I didn’t find from other brokers, such as instant deposit (though there are certain restrictions on what you purchase with the fund) and assistance from local office staff (see my recent comprehensive discussion on Scottrade for details about the broker). If I were to rate Scottrade and its service, I would give it 4.5 stars out of 5. What prevents me from giving it five stars is the fact that it still doesn’t offer free dividend reinvestment plan, while such a service is pretty common among other brokers. That kinds of frustrates me because I don’t understand the reason behind the decision of not allowing investors to reinvest dividend without a fee, at a time when dividends play an increasingly big role for investors looking for income other than interests in a low-rate environment. And because of its lack of free dividend reinvestment, I have chosen to use TradeKing instead of Scottrade when I bought Altria and Philip Morris International shares for the sole reason of getting and reinvesting dividends. Recently, I have added two more dividend-paying stocks to my portfolio, Union Pacific (UNP) and Abbott Laboratories (ABT), plus some shares of Cushing MLP Total Return Fund (SRV) that I mentioned a short while ago when I was considering investing in Master Limited Partnership (MLP). UNP was purchased through ComputerShare because it has direct stock purchase plan (DSPP) that also allows free dividend reinvestment and SRV was bought at TradeKing for the reason to the dividend distribution invested automatically for free. For ABT, I had to take a detour since ComputerShare only has dividend reinvestment plan (DRIP) for the stock that requires me first become an investor and transfer existing shares to ComputerShare before I can use the DRIP. So I bought a few shares of ABT last week, followed by a phone call to Scottrade to ask how I can transfer the shares to ComputerShare. During the conversation, I was asked why I want to transfer that stock out of Scottrade and I gave the reason of not being able to reinvest the dividend for free. Then the person who answered my call said free dividend reinvestment will come to Scottrade this fall and to help me go through the next few months before the service is available, I was offered some commission free trades such that I can use them not only to reinvest any dividend that I will receive without paying the commission, but also to buy ABT shares regularly, as I have been doing with most of my dividend paying stocks. The Scottrade free dividend reinvestment news has not been confirmed yet, but it’s definitely long over due. Also, Scottrade has the best customer service. It was awarded the Best Overall Client Experience this year(2012). TD Ameritrade is also a nice one who got the won Best Overall Platform and Best Web Based Platform in the 2012 StockBrokers.com Review.